A graduate with a degree in counseling gains extensive training, knowledge and experience that allow him or her to help individuals in need of personal, emotional, behavioral and/or professional guidance. The kind of treatment and advice a professional is qualified to provide depends on what type of counseling they specialize in, which may include rehabilitation, mental health, career, school, substance abuse, behavioral disorders, marriage, and/or family issues. The educational pathway to working as a counselor begins with earning a bachelor's degree and is then followed with a master's or doctorate level degree in counseling. A degree does not guarantee work but can of course greatly increase one's chances of being hired in this field. Where Can You Work with a Degree in Counseling? From assuming the role of a family grief counselor to providing mental health evaluations, counseling professionals with a bachelor's or master's degree often find employment at a hospital. Some counselors are hired to assist patients overcome various psychological and behavioral issues, while others may specifically focus on the rehabilitation of a hospital patient. With a Ph.D., counselors can assume the position of clinical supervisor at a hospital, as well as qualify for many other jobs in administration. According to the 2012 National Survey on Drug Use and Health (NSDUH) released by the Substance Abuse and Mental Health Services Administration (SAMHSA), 2.5 million Americans aged 12 or older (or 10.8 percent of those in need) received treatment in a specialized treatment setting for an illicit drug or alcohol problem. There are a reported more than 23 million Americans altogether who are in need of treatment, and counselors are hired to assist their road to recovery. Inpatient facilities hire counselors to assist with 24-hour care of high-risk patients battling substance abuse. Outpatient facilities hire counselors to provide treatment during the day, while patients are allowed to return to their homes at night. Substance abuse or addiction counselors may also serve as detox specialists or crisis workers within a detoxification center. Providing one-on-one treatment or holding group therapy sessions, professionals with a graduate degree in counseling are often employed at a mental health facility – oftentimes according to their specialty. For example, community counselors are hired at localized mental health agencies to assist a local population, interact with community leaders, and bridge the gap between support services found in surrounding areas. A master's degree in counseling can lead to employment as a social worker, mental health counselor, or case manager at a mental health agency or facility. A doctorate in counseling qualifies a professional to take a position as a coordinator or director of a mental health agency. A residential care facility provides counseling services to people living in a temporary environment that requires continuous supervision. This may include facilities that house troubled or at-risk youths, autistic children, or people with mental or physical disabilities. An associate's degree in counseling prepares graduates to work at a residential care facility as a substance abuse or addictions counselor, where they may hold one-on-one counseling sessions or lead group discussions with people suffering from a chemical dependency. Halfway houses, also known as transitional housing facilities and recovery houses, hire rehabilitation and substance abuse counselors to guide patients or residents in need of help transitioning back to a societal environment, their family, their community, and/or entering the workforce. Voluntary substance abuse halfway houses, which allow recovering addicts to transition from inpatient therapy to reentering society by living in a structured environment during outpatient therapy. Court-mandated halfway houses, which provide structure and support under strict supervision to formally incarcerated juveniles and adults reentering society. Mental health-related halfway houses, where individuals receive mental health counseling in a residential setting, such as patients that require medical supervision or victims of domestic violence. Counseling degree programs at the associate's level typically focus on training professionals as substance abuse or drug and alcohol counselors, but the majority of employers are looking to hire a licensed professional or someone with at least a bachelor's degree. Counselors, especially geriatric counselors, are often employed by facilities, agencies and organizations that serve the elderly population, such as hospitals, assisted living communities, senior community centers, retirement homes, independent living communities, as well as long- and short-term care facilities. According to the Department of Veterans Affairs (VA), there are more than 1,200 VA community-based outpatient clinics, VA hospitals, and VA vet centers in the United States. Counselors are hired to work with veterans, their spouses, and family to address issues, such as PTSD (post-traumatic stress disorder) and anger management. Usually, a master's degree is required for the majority of VA counseling positions. From mental health counseling to substance abuse counseling, the prison system employs counselors to provide individual and group therapy for individuals who are jailed, or living in a correctional facility. Correctional counselors also help develop a plan of action to assist inmates achieve rehabilitation goals, and prepare them for transitioning back into society after being released from prison. Assuming positions in the human resources or public relations departments of large retail organizations, counselors with as little as a bachelor's degree are hired in the retail sector. Job duties typically include improving company-customer relationships, as well as designing and conducting training programs. Primarily helping students to better navigate the stresses of growing up and successfully completing their studies, counselors play an important role at all levels of the school system, such as providing crisis intervention following traumatic or violent occurrences – like the death of a teacher, a gun violence incident, or peer suicide. Although a master's degree is often preferred, some counselors with a bachelor's degree are able to assume positions at a school. According to the Bureau of Labor Statistics (BLS), elementary and secondary schools employed 47% of all educational, vocational and schools counselors working in 2012 on the state, local, and private level. In an elementary school, a counselor often works with teachers and parents to evaluate a student's strengths and weaknesses, as well as identify any special needs. A graduate with experience in vocational or career counseling may find a fit at a high school, where they can advise students making future decisions regarding higher education and/or making career plans. 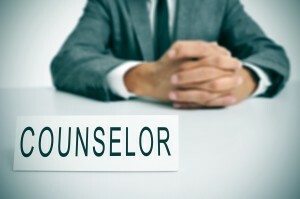 Often called guidance counselors, they also assist students with various issues commonly associated with teenagers, which range from self-esteem to behavioral issues to college and/or career planning. In high schools, a degree in counseling can also lead to job positions as academic adviser, career counselor, career services director, and guidance counselor. The BLS reports 31 percent of school and career counselors are employed at junior colleges, colleges, universities, and professional schools on the state, local, and private level. Those with a doctoral degree in counseling can teach undergraduate or graduate level studies at a public or private college/university. A director of career counseling with a college or university often holds a Ph.D. related to the field. The majority of graduates with a vocational or career counseling degree work in career centers associated with high schools, colleges, as well as state government agencies. A bachelor's degree in vocational counseling is acceptable for some places of employment, but a master's degree is typically preferred, especially for counselors applying for a position at a college and university career center. Outside of a career center, some counselors work as consultants that match candidates to corresponding employment opportunities. Graduates with a bachelor's or master's degree in counseling may assume a position with a rehabilitation agency on the state, private, and nonprofit level. A professional with a doctorate in counseling qualifies to become a director of a rehab facility. Counselors also find work in other job settings that involve rehabilitation, such as colleges, elementary and secondary schools, prisons, and independent-living facilities. Providing an array of counseling services centered on mental health, rehabilitation, substance abuse, and other areas of social work, counselors with undergraduate and graduate degrees find work at nonprofit or social service agencies. Job candidates with a Ph.D. are qualified to oversee family counseling services for such agencies, including the governmental division of Child and Family Services. Counselors who specialize in combining traditional mental health counseling with the Christian faith often work in private practice and/or religious work environments, such as a church. Professionals must obtain a certificate in Christian counseling before they are able to use the Bible and religious teachings to treat clients. This type of professional is also not limited to strictly working in a religious setting, and may assist anyone in need of counseling. Those with a Ph.D. in counseling can become a licensed professional counselor that works in a public or private practice. Most often, this type of counselor concentrates on a particular area of specialization, such as mental health counseling, family and marriage counseling, or substance abuse counseling. A bachelor's degree in counseling allows a graduate to assume the position of an administrative assistant or researcher that works under the direct supervision of a certified psychologist with his or her own practice or business. In conclusion, the number of places that a graduate with a counseling degree can work is wide-ranging, and the above-mentioned employment opportunities are non-exhaustive. Depending on a professional's level of education, counselors are also hired at insurance companies, private government agencies, summer camps, law offices, and Fortune 500 corporations.